Ddraig Goch - Red Dragon symbolises the sovereignty of Britain, and is the totemic beast of the greatest line of kings, the Pen-dragons. 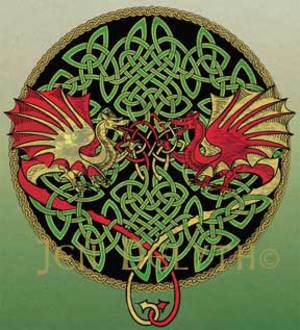 Dragons and serpents of the Celtic religion symbolise earth energies - the dragon lines/ley lines. The Red Dragon is derived from the Great Red Serpent that once represented the old Welsh God Dewi, Saint David. There is a legend that the British tyrant King Vortigern, was attempting to build a fortified tower, thought to be the hillfort of Dinas Emrys in Snowdonia, Wales, but the structure kept falling down. A young boy was brought to be sacrificed to save the tower. However, the young Emrys had powers of prophecy, and he saw that two dragons, one red and one white, were fighting in an underground pool below the weak foundations. Emrys prophesied that the red dragon would slay the white dragon, and the Saxons would be driven from Britain. Y Ddraig Goch Ddyry Cychwyn - The Red Dragon will Rise Again!